How to Buy Specialized SMT Equipment with custom design or operation? Let’s say you have an unusual product configuration, a unique space requirement, an unorthodox handling system, or an application totally unrelated to the PCB or SMT assembly business, and you can’t find a standard machine provider that can handle your requirements. What then? Time for a custom machine – or perhaps custom features on an existing machine! There are a handful (a very small handful, actually) of true manufacturers of assembly equipment that serve the low- to mid-range volume users. If you want a standard stencil printer, pick and place machine, reflow oven, wave or selective soldering machine, etc., you have dozens of firms to choose from. Most of them, however, are actually importers and/or resellers and have serious limitations on the kind of customization they can do. 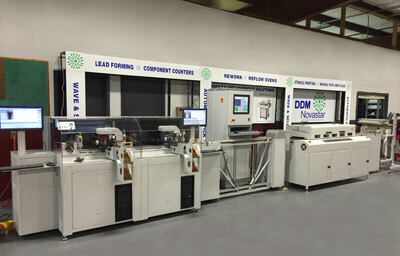 Learn more about DDM Novastar's custom capabilities. A company that required a reflow oven with a very long dwell time in the chamber, which would normally require a 40-foot tunnel, but needed to fit it into a foot-print only 6 feet long. The solution was to design and build a serpentine conveyor within the length of a short tunnel that achieved the dwell time dictated by the process and footprint. A user looking for a totally integrated inline component placement process from a reel of blank substrate at the beginning to a fully populated reel at the end. The customer got a self-contained system that accurately attaches miniature medical devices onto a strip for seamless downstream processing. A custom pick and place application that selects a component, dips it into one or more materials at different stations, such as paste or epoxy, then accurately centers and mounts it on an substrate. An off-the-shelf pick and place machine was modified for this application with custom jaws and positioning software. This example also required two different reservoirs for a “double-dip” function. A process to place multiple micro-chip lasers onto a block to aggregate a high intensity beam into a single point for a steel laser cutting tool. Due to the accuracy required for this project, the pattern layout was critical. A machine was custom-engineered which included unique LED lighting configured to handle special gold plating. Unique sequencing operations and processes for assembly machines conducting operations on multiple stations that require custom software programming. In addition to putting an inline system together, one needs to make sure the programming can be customized also. 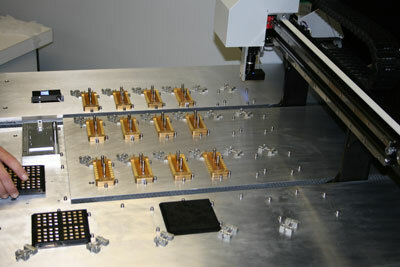 An example of this was an assembly line that needed to dispense paste, inspect, accurately place the components, index through a cutter assembly, provide a feed control system over to an accumulation loop, input that feed into the reflow oven process with vision inspection of finished assembly. Material handling systems with special line functionality, such as reverse feeding or a capability to manage large or odd-shaped parts. One customer already had an inline system, that required their new reflow oven to move right to left, in reverse of the norm. There are some worthwhile goals that might drive you to consider going to the trouble and expense of a non-standard machine, such as reducing labor and improving predictable quality by integrating multiple processes together and reducing dependence on non-skilled labor. While the upfront investment will be considerably higher than that of a standard machine, the ROI – depending on the application and volume – could be short and significant. So, how do you look for a custom machine manufacturer that has sufficient experience in the PCB/SMT assembly world that you can trust with your project? Start by asking the sellers of equipment what – if any – customization they can do. If they can, then describe your objectives and constraints, but don’t tell them how to do it; let them get back to you with a recommended solution. If you attempt to dictate how to build a machine rather than describe its functional purpose, you could be liable for taking delivery of something that does what you’ve asked, but fails to live up to your performance expectations. Ability to design and make any special tooling required to manufacture small table-top machines to large assembly / process equipment.